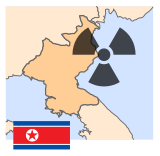 The North Korean nuclear test was the underground detonation of a nuclear device conducted on 25 May 2009 by the Democratic People’s Republic of Korea. This was its second nuclear test, the first test having taken place in October 2006. The country also conducted six short-range surface-to-air missile tests.